Cheese balls will forever remind me of my best friend Katie and The Big Cheese. Katie made a cheese ball one of the first times that she met my then husband-to-be. Mr. Fiance had turned his nose up at the cheese ball and we just laughed. He had no idea that Katie had been making them for years for her mom’s deli. We were snacking on it and before we know it, Thomas has the plate and literally eats the whole thing before we even had time to ask for another bite. We still tease him about the cheese ball stealing incident all these years later. What can he say? A cheese ball is definitely worth stealing! 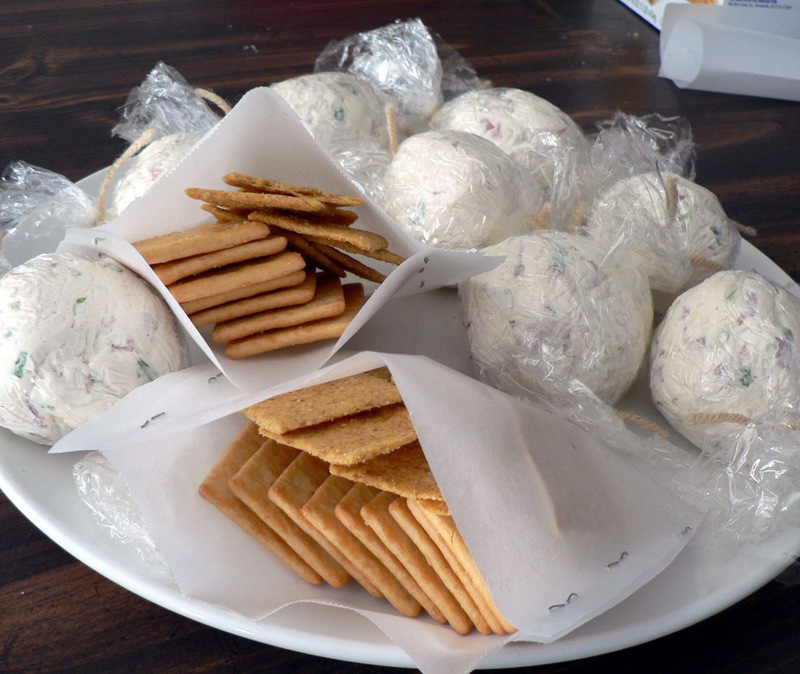 I made mini cheese balls and cute little cracker packs this year to give on my goodie plates. I thought a little salty would break up all my sweet. To make the cracker packs just tear off a 6 or 7 inch piece of parchment paper, fold it in half, and then cut it 3 times. Staple up each side to create a little pocket that measures about 3 inches tall by 4 inches wide. This recipe will make one giant cheese ball or 8 cheese balls that are about 1/2 cup each. Wrap individually in plastic wrap, tying off the ends with yarn. You can roll these in chopped pecans or walnuts if you choose. I was giving them to people that I didn’t know, so no nuts was the best option. It’s up to you really. In a large bowl add the cream cheese, green onion, roast beef, garlic powder and Worcestershire sauce (add the smaller amounts of the garlic powder and Worcestershire). Using your clean hands, blend everything together really well. The heat from your hands really helps to work everything together. Taste with the crackers you are using. Add salt if needed and more Worcestershire or garlic powder as needed. Taste again and adjust accordingly. 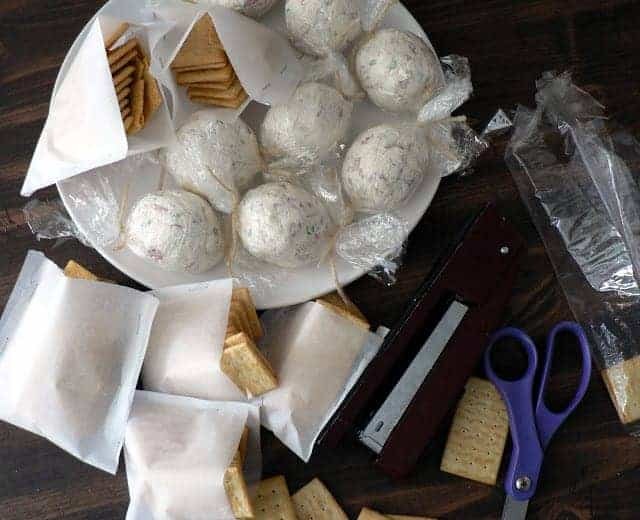 To make mini cheese balls, take a handful of the cream cheese mixture and pat it into a ball about the size of your fist. Place ball on a plate and repeat until you have used all of your mixture. You should get about 8 balls. Roll each ball in nuts if you choose then wrap and plastic wrap and keep in the fridge until you are ready to use them. To make a party-sized cheese ball, scrape as much of the cream cheese mixture as you can from the bowl into your hands. Pat and roll in between your hands to form a ball. Roll in nuts if you are going to, reshape, and then wrap in plastic wrap. Let it firm up in the fridge for at least 1 hour before serving.